This is College Physics Answers with Shaun Dychko. I’ve drawn a free body diagram of this stationary box. It has a weight of 40 Newtons downwards, so there’s a normal force of 40 Newtons upwards then. 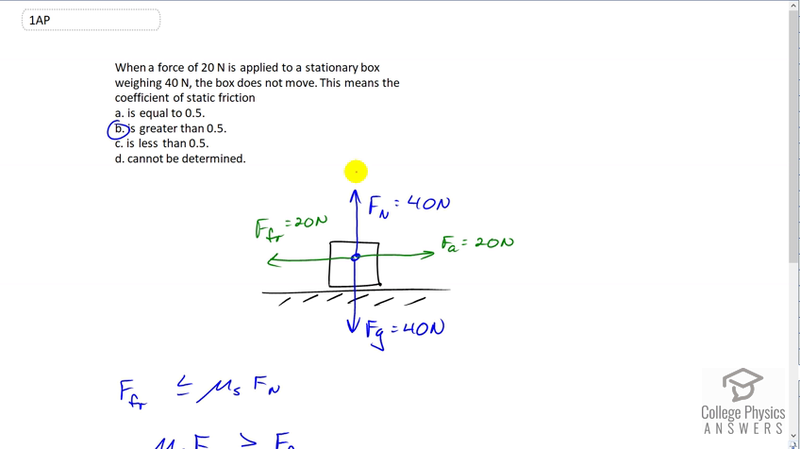 There’s an applied force horizontally of 20 Newtons and since the box is not moving that means the friction force must be opposed to that, also with 20 Newtons. Since the box is not moving, this friction force is static friction. So static friction is less than or equal to the coefficient of static friction multiplied by the normal force and we can switch the sides around and say that mu s multiplied by Fn is greater than or equal to the friction force. Then we’ll divide both sides by Fn because our job here is to solve for mu s here. So we have mu s is greater than or equal to friction force divided by normal force which is 20 Newtons divided by 40 Newtons which is 0.5. So the coefficient of static friction is greater than or equal to 0.5. Which is answer b.